The Arboricultural Association is a registered charity with a mission to promote trees and the profession which enables their sustainable management. Over the past few years we have been engaging partners in related industry sectors as well as educating MPs through our parliamentary group. In 2017 we are keen to spread awareness and increase knowledge of the benefits of trees and of tree care professionals to the wider public. The Association welcomes anyone interested in working together to further these goals. The Arboricultural Association offers a grant to support research into a relevant arboricultural topic on an annual basis. Applications are invited for funding of up to £5,000 for projects based within the UK. 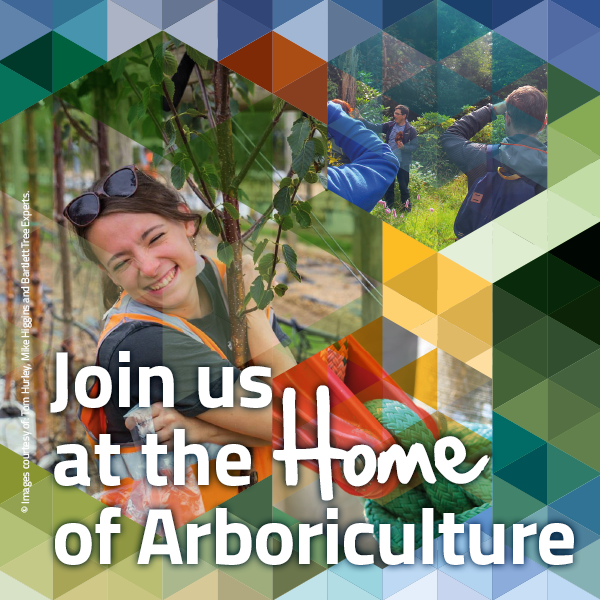 The promotion of careers in arboriculture, apprenticeships, careers events, talks at colleges, free corporate membership for all colleges providing Arb training, FREE membership for students and apprentices. The development of career linked courses (e.g. R2 and Utility and recent and City and Guilds land based qualification). The provision of information to members and the public via the web and emails alerts. Keeping training prices as low as we can to encourage take up in an industry where we appreciate pay for many is not high. The communication of standards and information aiding knowledge and understanding via the ARB Mag, eNews, the AA Amenity Conference, the ARB Show, publications and “Latest News” on the Web. Taking the lead on new industry policy and guidance (Biosecurity). Providing technical advice and support to members and limited advice to the public. Free events for Tree Officers (public facing officials). The development of industry guides and help and advice for Arborists (e.g. Industry Code of Practice and AFAG). Representing arboriculture “to act as the Voice of Arboriculture”, bringing arboriculture to the respective audiences, building partnerships with associated bodies in related sectors. The promotion of careers in arboriculture, apprenticeships, careers events, talks at colleges, free corporate membership for all colleges providing Arb training, £10 membership for students and apprentices.